To celebrate Monday I am posting two new paintings this week on RVJart.com. The images are of the moon rising and setting. The name for Monday is derived from Moonday in many languages around the world. Lunes in Spanish is from luna (lunar) giving the same idea celebrating our closest natural satellite. 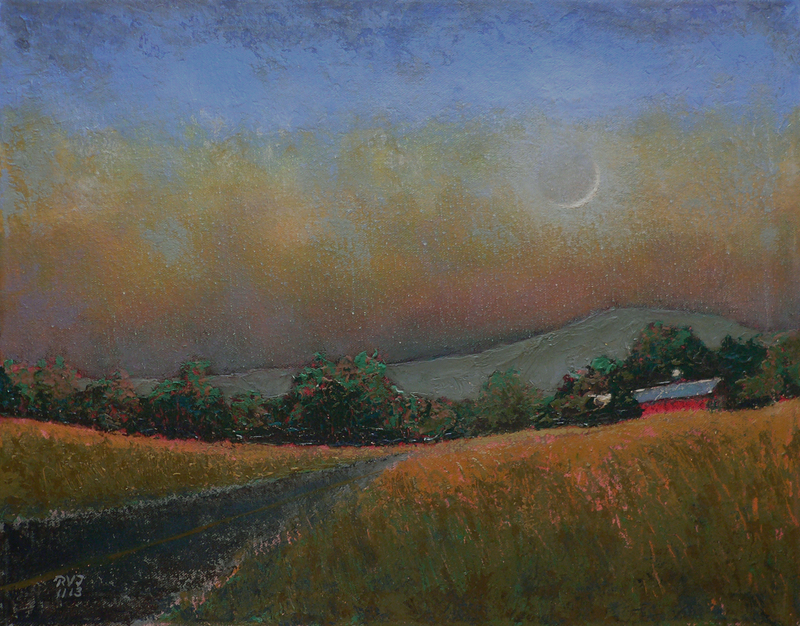 Moonrise 91 (above) and Moonset 5 (below) are oil paintings recently completed. The image above is the harvest moon rising over interstate 91 in Putney Vermont at the height of fall foliage color. In Moonset 5 I have heard of this sliver of moon setting called a “Cheshire cat moon” derived from Alice’s Adventures in Wonderland‘s Cheshire cat smile. 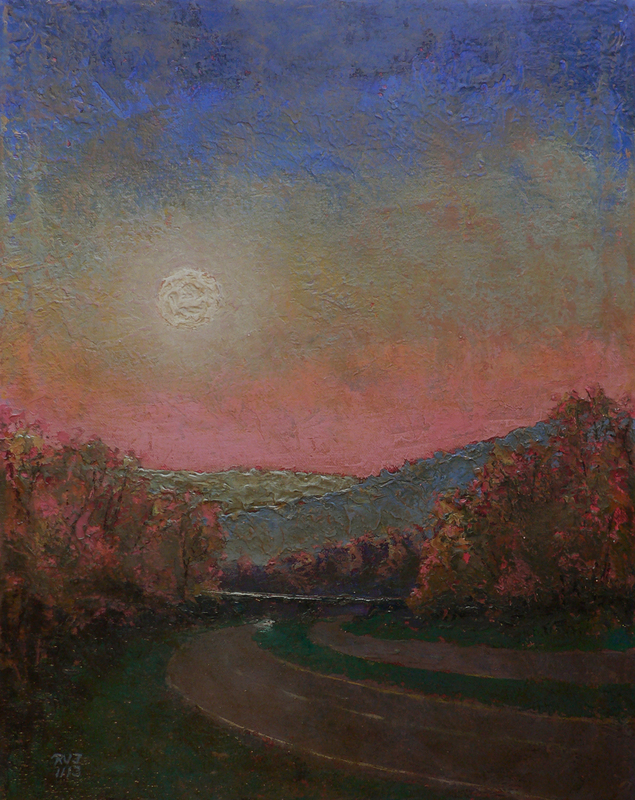 This moon is setting over Route 5 near Brattleboro, Vermont with the river mist rising from the Connecticut River and tinting the atmosphere. In these paintings I am experimenting with low light levels at late twilight. The fading color at twilight is a function of our eyes not seeing the light rays reflecting off of the objects. The color is there, we just can’t see it. I am exaggerating the hue saturation to create a dream-like quality. The moon provides a cool light, hence the slightly cooler palette than I normally use. This series of works are heavily textured with layers of paint and tool marks evident on the surface. They are beautiful..especially Moonset 5. I love it! So what do you all think about a $1 a week viewing rights? Would you donate to keep my site running if you are using the images as wallpaper? Is that reasonable to even ask? Very soothing and dreamy! like Fred said, setting as desktop! Moonset is my favorite also, Roger. Both are beautiful. Thank you for the interesting info about the moon. I really like both of the paintings, especially moonset. We saw the moon as you have painted (showing the remainder of the moon’s circle as dark and circular…) on the last cycle on a clear night. Congratulations Roger on capturing the scenes so lovely. Tina, that detail of Moonset 5 was fascinating to me. My guess is that with a clear atmosphere the reflected sunlight off of the earth (earthshine) illuminates the darkened portion of the face of the moon slightly making it visible. The texture of Moonrise was first to draw me in. But the delicateness [of the detail not the style] of Moonset decided it for me. Thank you for also expanding on the Moonday information, I was not aware. In reference to your question; I do think it is reasonable to ask for $ compensation if images are being used by viewers. It would be great if you could control the quality of the image so they can be used as desktop images but not printed out to be full scale wall hangings. Another possibility would be selling the images as slides or slideshows again controlling the quality for reproduction control etc. Happy Tuesday! The name Tuesday derives from the Old English “Tiwesdæg” and literally means “Tiw’s Day”.Tiw is the Old English form of the Proto-Germanic god *Tîwaz, or Týr in Norse, a god of war and law. I appreciate the feedback Ernest, I am happy that my images are getting out there and being shared, however, as I have posted before, artwork is work and deserves compensation. The fact that a patron is viewing the image is good. When the image is cherished enough to be used as wallpaper strikes me as the point at which perhaps a donation (if not outright buying the artwork 🙂 ) is due to the artist. This conversation may end up being a separate post. Anyone else have thoughts? I agree that a charge for desktop use is a good idea, but $52. a year seems like a lot for a screensaver. Another solution may be making prints of your paintings to draw income as well. The $1 a week was a suggestion figuring that you wouldn’t use the image for 52 weeks (even though I think that even that is reasonable 🙂 ). My question to the viewer would be, what is the value of having art in your life? The idea of making prints available is one that I have held for a long time. My feeling is that a print is a step away from the act of creation. It is a dilution of the spirit involved in creation. And does not have the depth of the original. Will any of you collectors out there affirm this? I price my work reasonably. Many of my smaller works go for what prints are sold for by reputable artists. One idea I have is to have a “donation jar” on the website so if you enjoy viewing the work you can leave a dollar or two to help fund the expense of the site. (which is hundreds of dollars a year, not including my time). Thanks for the feedback. Thanks for filling me in on your views. I can see now much better of the costs involved. I think a donation jar is a great idea. Would you use Paypal for it? Paypal would be the easiest way, you don’t need an account and it is secure. Can anyone think of other options?